I was listening to a conversation on Facebook the other day about handicapped accessibility and transportation at an event. One of the people who requires occasional transportation stated that they were told the site was “extremely compact” and it would only be about “1/2 a mile” from where she was to be camped to the main activities area. But for a lot of people, old and young, 1/2 mile is just too far to walk. You are the only one who can make that decision. But get real about it. A cane, a walker, a small portable stool for rest breaks, or an electric scooter are all possibilities at events. I was once confronted by someone who told me that our small baronial event (usually less than 400 people) should provide a golf cart for transportation for those who can’t walk. I was blunt and said it would not happen. It was just not likely to ever be in the budget. In the past when I have recruited a helper for my booth at Pennsic I have warned any prospective folks that it is a comfortable twenty minute walk from our camp to my booth. We are by no means the farthest away camp, and our walk does not include any large hills. If you are planning to go to an event you really need to try to understand just how much walking you are going to be doing. I always told my helpers to make sure that they had at least two, and preferably three pairs of shoes with them so that they could trade off shoes if their feet got sore, and so that if their shoes got soaked from rain and mud, they would have dry footwear. 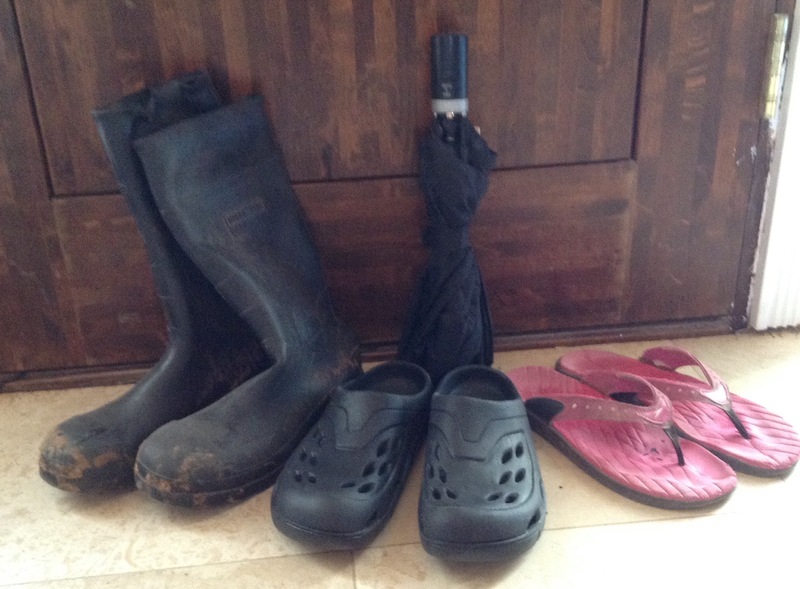 I have even been known to change into flip flops or rubber muck boots to keep my shoes dry. Several of my friends who have rather sedentary desk jobs start a walking program a month or two before Pennsic to build up their stamina. Sore feet or exhaustion from too much walking can really spoil your fun. And this doesn’t even count the weather. This is just a small portion of our “just in case” collection. For a solid month before I attend a camping event I add that event location to my weather.com feed and check the weather there every day. I also look at the national forecast to see if there are any trends or major weather events that are likely to impact the area that I am camping in. Two years ago the forecast for Potrero war was cold and foggy. It had been that way for two solid weeks before the event, and it was forecast to be that way for the event. And yet people were totally shocked when it was cold and foggy. I warned my helper to bring her long johns, because it was likely to be cool. We were fine, but a lot of people were totally unprepared. No cloaks, no warm socks, and not enough bedding = less fun. This entry was posted in Camping, SCA Life and tagged camping preparedness, SCA camping, SCA prep, SCA weather, watching the weather by Eirny. Bookmark the permalink.